Is it normal for Drum Racks to not let you route to your returns in the session view and receive as sends? Here I have the two default returns...A has reverb it, B has simple delay. Here is a snapshot of drum racks. Under "Audio To" shouldn't you be allowed to select A or B from the menu? 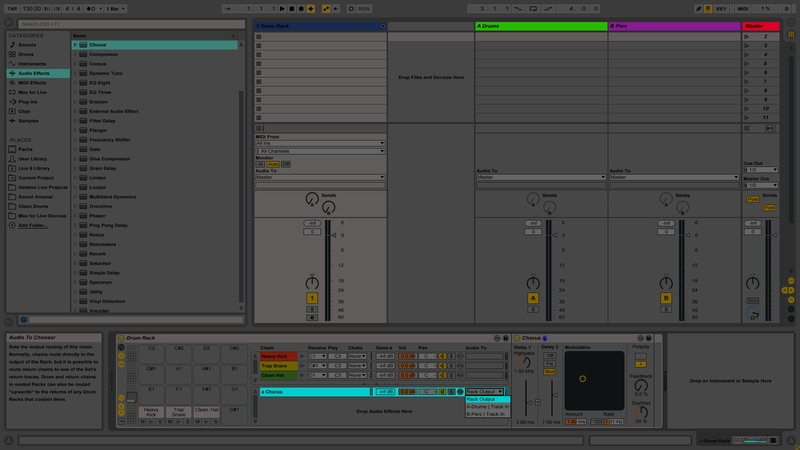 Here is another screen shot of the Drum Racks return window after I drop a chorus into the Drum Racks return. Now my question is why does it now suddenly enable you to have access to sends A or B now after I dragged a effect on the Drum Racks return? I can even delete the effect I just dropped and still get access to the returns from the session view. Im trying to figure out if this is a bug or normal behavior...can anyone confirm it as a bug or make sense of it? Also sorry for the large screen shots. This is unfortunately a bit confusing indeed, but not a bug per se. It's the specified behavior of drum racks as they are today. "Normal" chains can only be routed to the rack output. One exception is a nested rack, where you can route a chain to the return chains of the parent rack. The routings are not persistent, e.g. 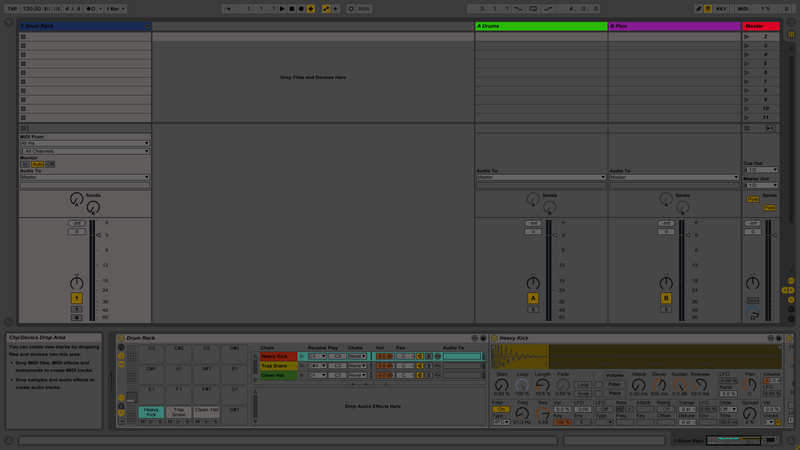 if you save your drum rack as a preset and load it into a different Live set, then the routings are reset. You can only have 6 return chains in a drum rack, as opposed to 12 return tracks in a Live set. The send controls for return chains are shown in the "send section" of the chain mixer and look very similar to the send controls on normal tracks, which is slightly confusing, as there are two concepts being mixed up here: return chains and return tracks. I think the problem that needs to be solved in the future, is to combine the two concepts of send/return routing (chains vs. tracks) in a more elegant way as we have today.